After my last tour with Safarix (with Ingo) in March 2017 i would like to say what a great tour it was. Since then carried on with the bike dream, after looking at your website there are no dates in March? 2019. A Dutchman with 4 Germansand one Swiss on an Austrian bike in Morocco. After being in Egypt and Namibia for an off road trip it was time to discover a land from which I heard many good off road stories: Morocco. Every time I heard the same thing: extreme variety in landscapes, a real Eldorado for off road enthousiatstics, vast sceneries, challenging tracks. Then the second step was to choose an company to go with, after several hours with Google I found www.safarix.de. Finally I found the right trip, 2 weeks of riding including a rental bike with good lodging and a route with mountains and desert. Arrived on Marrakech in the evening I met the rest of the group, 1 Swiss and 4 Germans and we received and complete and clear briefing of Ingo. 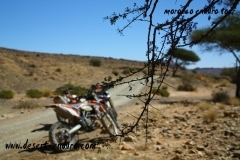 After a good night we received the bikes, for me an KTM Freeride 350, a bike with not so much power, but thanks to a very low weight very very agile , and that is what I need on a narrow track in the Atlas mountains. Ok, others received 640 KTM’s, with more hp, but who needs so much power in a rocky dry riverbed? The first hours we drove an windy tarmac roads to get used to everything. The Atlas mountains were topped with snow, the sun was shining en we drove to the highest point of the road at the Col du Tichka (2260 m). And then……the first river crossing and the first dirt tracks…..there were many more to come and it was splendid! In the hotel in Ouarzazate the beer and the swimmingpool were both cool!! The next day was to ride around the area of Ouarzazate, we visited some props of the famous studios like an medieval castle, an prison and even the Ka’aba of Mekka. After that it was time for more earthly oriented action; the speed at the relatively flat area was despites the rocky tracks quite high! The next day the aim was to arrive at the Dades valley. The scenery changed rapidly into deep red canyons with some times a dry riverbed crossing and sometimes a wet riverbed crossing. In a very tiny village we had some mechanical problems with one bike which we could not fix, thanks to the satellite phone help in the form of Ingo with the support van was soon under way. After this delay we drove through an enormous wide valley which seemed to have no end, as a Dutchman this was unbelievable that you just don’t see ‘civilization’ for so long. In the mean time the local people treated us, spontaneously, on tea with nuts and we tried to talk with the local kids with gestures and improvisation. That was very funny! At the ‘Auberge’ the fireplace and mint tea gave us an warm welcome. Also warm was that after the dinner some friends of the waiter came, to sing old Morocco songs with traditional drums. After a good breakfast we drove on tarmac along the rest of the Dades valley, in which we also had some serious hairpins, the scenery was awesome! After the planes it was time to follow a mountain ridge, the track was really like a race track with perfect curves which were very demanding to ride. In the hotel I deserved a real good splash into the swimming pool. Today was planned to have a little relaxing near the swimming pool which was no problem. We also climbed a dune by foot……But I came for riding so I was glad that in the late afternoon we went out with the bikes to the dunes, which started right behind the hotel! Riding in the dunes is absolutely great fun to do, you have to ride very smooth with no clutching and no breaking, just play with the gas and your balance. Hurray! Today 2 dunerides were planned. The first was to climb as high as possible end the second we drove on very loose sandtracks, also called ‘panzerstrasse’. In between we relaxed at the pool. Now the longest day was beginning. 200 kilometers of which 95% non-tarmac to Zagora. We set off at 08:00…..In the beginning there was a lot of dust, so we had to keep some distance of each other. Together with the infamous camelgrass 100% attention was required. We were glad that after 1,5 hour we could drink some hot tea in a cosy place. Now again I realized that eastern Morocco is sparsely populated, we did not see any villages or what so ever, only red mountains end rocks, rocks, rocks. Here there a no petrol stations, so it was organized that at a certain place there some plastic Coca Cola bottles with fuel available for us, now we were no tourists but travelers….Tired we arrived at Zagora…. The last day was in sight, but on this day we first drove along palm fields and so able to see the rural side of Morocco. We also made a few very steep descends on tracks with big rocks, which was very challenging. The last day: some parts were the same as the first day (Marrakech-Ouarzazate), but now there were some nice surprises: a tarmac road which was like a single track in Scotland: curves, curves and curves. Also a scenery which reminded me of Corse but then riding on loose ground! 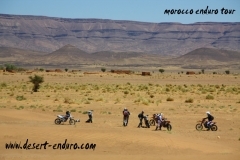 Morocco enduro tour – Tour in october with Ingo, thanks for the nearly two awesome weeks. I had a lot of fun. I hope I keep in mind to put a comment on your website. In total the daily riding advenged my riding skills extremly! The second guide was good, also in this little group. The solution of problems (exhausting, injured foot) For me it’s important that a organizer switch his plans this way that the person with problems, don’t got to do anything. And of course the rest of the group had to have fun. Comment from two bavarians 53 and 51 years old who take part at the morocco trip from SafariX in march. We don’t got any expectations in this trip. We know that it is an beautiful country which we wanted to discover after Romania, Greece, Sardegna, San Marino and Croatia. The bike transport to morocco and back was excellent. The tour was a lot of fun for us. At first we came into the atlas mountains after a few riverbed kilometers, were we discovered beautiful mountain landscapes. The daily trips were about 7 to 9 hours of riding which was really challenging for our condition and riding skills. Good was that the not this advenged riders had the possibility to cut the daily track and go on asphalt to the hotel. Also the injured people got the possibility to go on in the van of Ingo who is the tour chef. The night at the house of a friend from Ingo in combination with best african kitchen was very enjoyable . After a few days (Todra and Dades Valley) we came on fast pists in direction Erg Chebbi, were the 200m high sand dunes welcomed us. Here we stayed three nights in a lovely hotel and could ride complete 2 days the dunes. Then we turned, direction Marrakech again, were we took the flight back home after the 11. night. 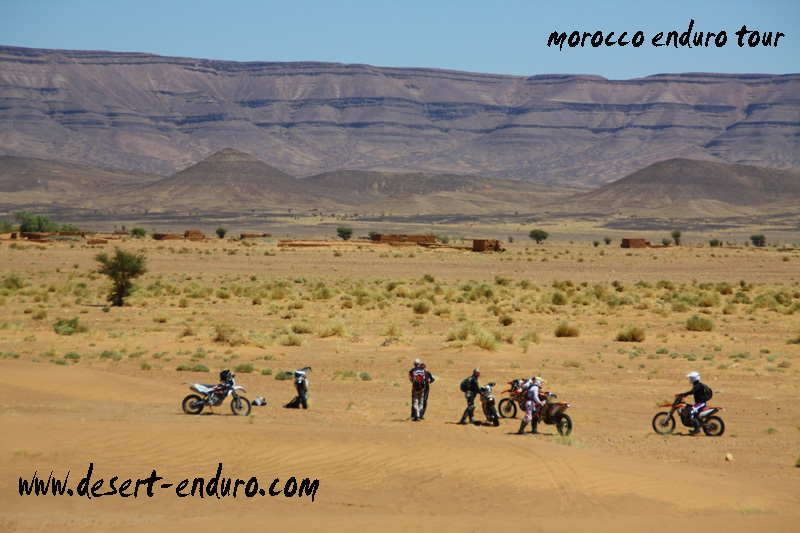 We discovered a part of morocco with the most awesome landscapes on the nicest tracks. Beautiful but poor people we met. Also we saw the extremly difference between poor and rich in the city of marrakech. I want to thank our guides Ingo and Eric for the excellent organisation. I can recommend this trip to everybody. It’s no touristical trip, were is everything included. Man and machine have to do there part! I wish you all the best for your company. I like you organisation during this adventure.